The first edition of this dictionary, compiled by F.J.M. Wijnekus and published in 1967, was the result of years of systematic collection and preparation of thousands of terms and expressions which were until then not to be found in any other dictionary. The material was correlated for use in his daily work and, as the reputation of his private collection spread, there was an increasing demand for access to these findings. Until 1967 there was no comprehensive multilingual dictionary on the subject; former publications were incomplete and out of date and lacked clear definition - often leading to disastrous misunderstandings. 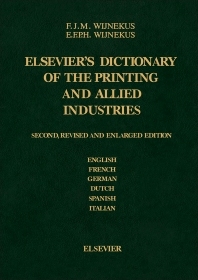 Furthermore, the subject of printing, paper and ink technology had never been dealt with, in dictionary form, in relation to other aspects of the graphic industry. This new work, prepared by F.J.M. Wijnekus and his son, has been considerably up-dated. Much time has been devoted to checking the material against the most reliable and authoritative sources. The usefulness of the work has been further enhanced by the addition of Spanish and Italian to the original languages of English, French and German. The first edition was received with much enthusiastic praise and this new dictionary will undoubtedly continue to be an invaluable tool for all those working with the printed word in the widest sense. It is a reference work which should be in the hands of all those in any way connected with the printing industry, paper manufacturers, ink manufacturers, printers, bookbinders, publishers, lithographers, lay-out men and graphical research institutes.